The importance of preventive care is no secret. We all know how critical it is to eat well, exercise regularly, and visit the doctor annually. Often regular eye exams are not part of individuals’ preventive health practices, and they should be. In the United States 23.7 million adults (or 10 percent of all American adults), report having trouble seeing even when wearing corrective eyewear, or that they are blind or unable to see at all1. Clear vision is essential for completing everyday tasks, performing well in our jobs, and experiencing our world. Far too often we neglect to protect this important sense with comprehensive eye coverage and regular vision exams. Many of us wait to see an optometrist until we notice a change in our vision. Unfortunately most eye problems do not have obvious symptoms. Getting an eye exam each year ensures that we monitor our vision and can prevent or reduce problems that result in vision loss. Annual eye exams are critical for maintaining our eye health, but vision care also has applications beyond vision correction. This is significant because the eyes are the only places on the body that provide an unobstructed, non-invasive view of the blood vessels. Through comprehensive eye exams, eye doctors can diagnose serious eye diseases including glaucoma, macular degeneration, and diabetic retinopathy. They can also detect signs of serious systemic conditions, such as diabetes, high cholesterol, and hypertension. What is the economic rationale for a vision plan? 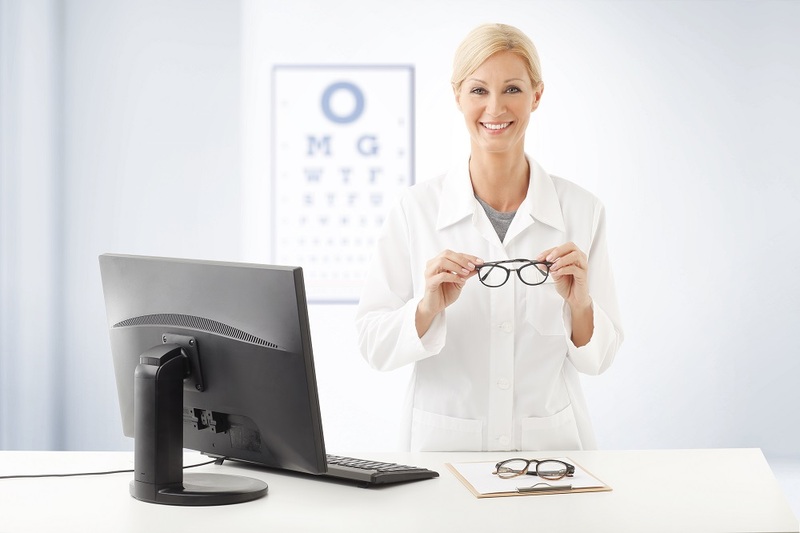 Vision care is important for personal wellness and preventive care, but it’s also a low-cost, high-value benefit for employers to offer at virtually no cost to employees. 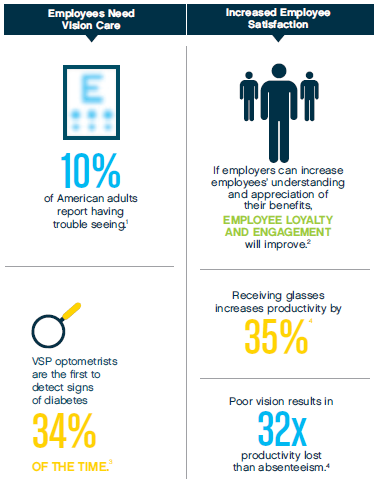 Vision benefits allow employees to better manage their vision and overall health, and offer a wealth of advantages for employers. 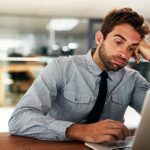 When employees are unable to see clearly, how productive can they really be? Poor vision results in 32 times more productivity lost than from absenteeism alone, according to Vision Council3. Employees with vision needs who receive glasses are able to increase their productivity by 35 percent over a two year period. Because vision exams offer early detection of vision problems and other chronic health conditions, they play an important role in disease management. A recent study conducted by Human Capital Management Services Group (HCMS Group) found a 145 percent return on investment on the initial dollar investment due to early detection of chronic diseases, reduced employer medical costs, less employee out-of-office time, and fewer hospital admissions and ER visits. It’s clear that vision care is a valuable benefit for both individuals and employers alike. With the unique ability to provide early detection of vision and overall health conditions, vision coverage is an essential element of an employee benefit package that truly pays for itself. This article appears in the most recent edition of Cardinus Connect. You can download it for free here. Written by Pat McClelland, US Vice President of VSP Vision Care. You can find him on LinkedIn here. 1. American Foundation for the Blind, National Health Interview Survey (NHIS), c2015. 2. Study commissioned by VSP and conducted by HCMS from November to December 2012. Study sample consisted of randomly selected, geographically representative shops with nearly 850 private-practice independent optometrist locations and nearly 450 retail chain locations.